So, there’s this little gem in Texas in the form of a town called Fredericksburg. My family decided to “camp” there over the weekend with our kidos in my dad’s camper. I put the word camp in quotations, because to me camping should be done in tents. That’s real camping. Camping done in an RV or travel trailer is pretend camping (but still fun and actually a great option for a family with really young children). Warning: Lots of pictures to come. As my husband and I are driving there on Thursday, I entered in the park in good ol’ Google. Search: Jellystone Park in Fredericksburg, TX. 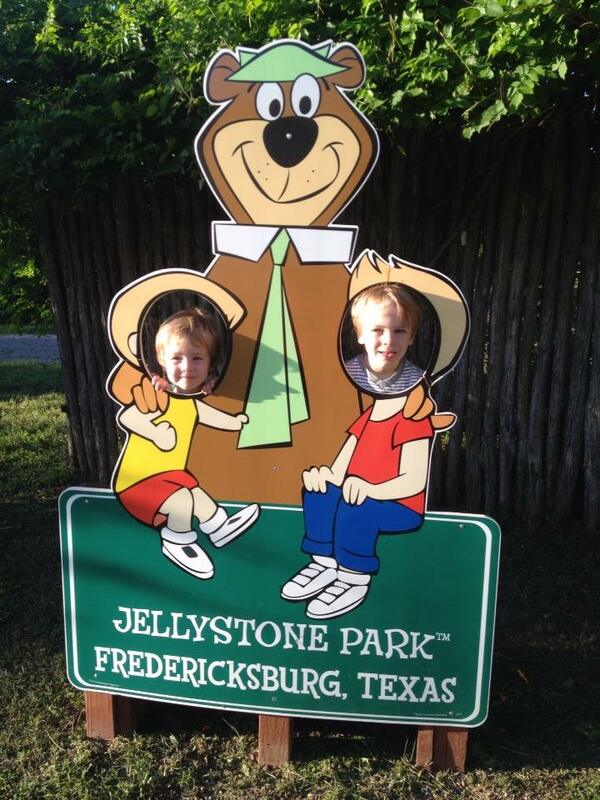 Well, what came up was a Jellystone Park near Fredericksburg, TX in Canyon Lake, TX. I figured that was it so I plug that address into my iPhone, which only took me about 15 minutes. You should know I’m terrible with technology and have had a smartphone for less than a year… so there’s a learning curve. By this time we are in San Antonio and I’m giving my husband directions. He seems leery of these directions, but I just assure him, “It’s what the GPS says!” Needless to say, after ending up in Canyon Lake (an hour away from the Jellystone Park my dad was at with his camper) I was lovingly fired from being the navigator. We laughed about it later. Much later. P.S. This is a great park for young children. They have sites for RVs or travel trailers, cabins on site, and also sites for tent camping. They do fun activities on weekends that are family oriented, and have fun things on the campground, like a playground, a swimming pool, and walking trails. Here is what you should enter in Google to get an accurate location: Texas Wine Country Jellystone Park. Good to know. Once there I fell in love with the scenery. 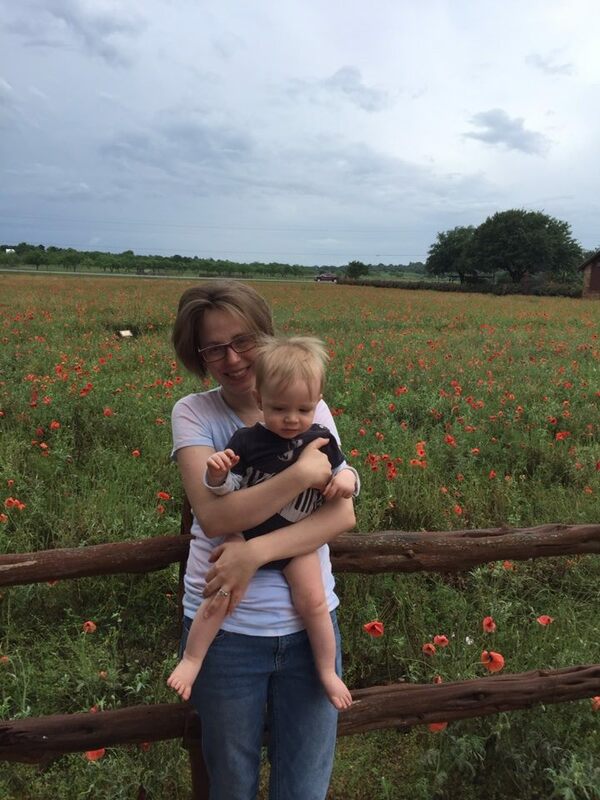 Trees, hills, and Texas wildflowers lined the highways. My boys just wanted to walk around and explore, so that’s what we did. 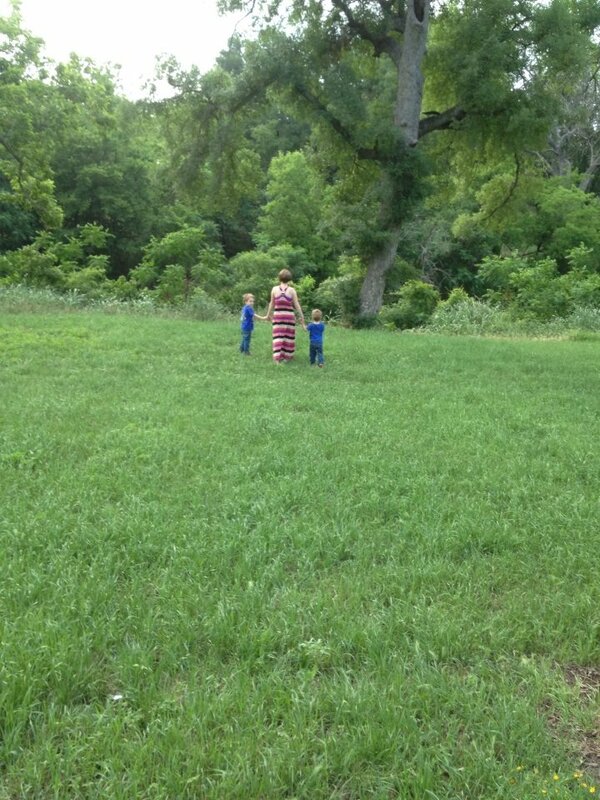 We explored the park, played on the playground, Noah went swimming, we caught grasshoppers… and we caught a stomach bug. One by one everyone got sick throughout the weekend, except for baby Isaac and myself. Friday we went to Wildseed Farms, and if you love plants, you’ll love this place. It’s a huge nursery with little shops filled with merchandise, wine tasting, and restaurants nestled in. 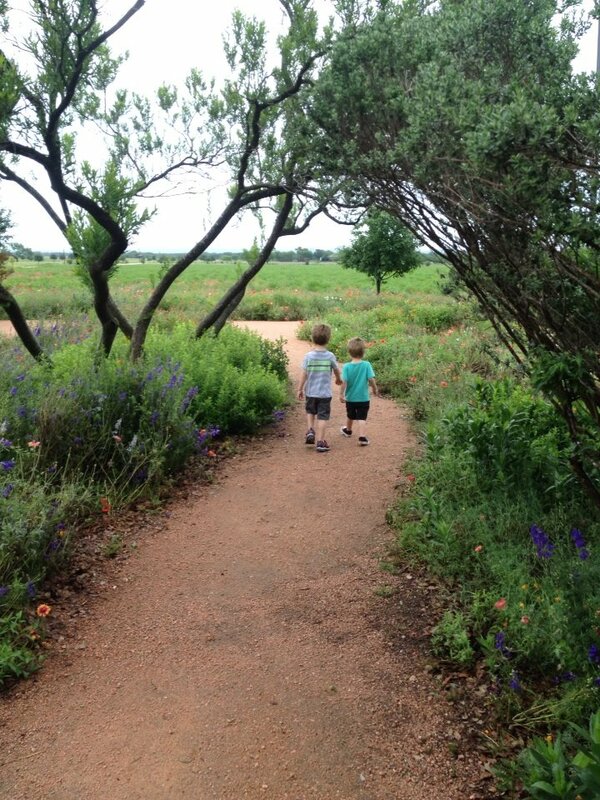 They also have a walking trail highlighting the Texas wildflowers in season, so we went that route. Y’all, I could stay at that place all day long and just drink in God’s goodness through nature. 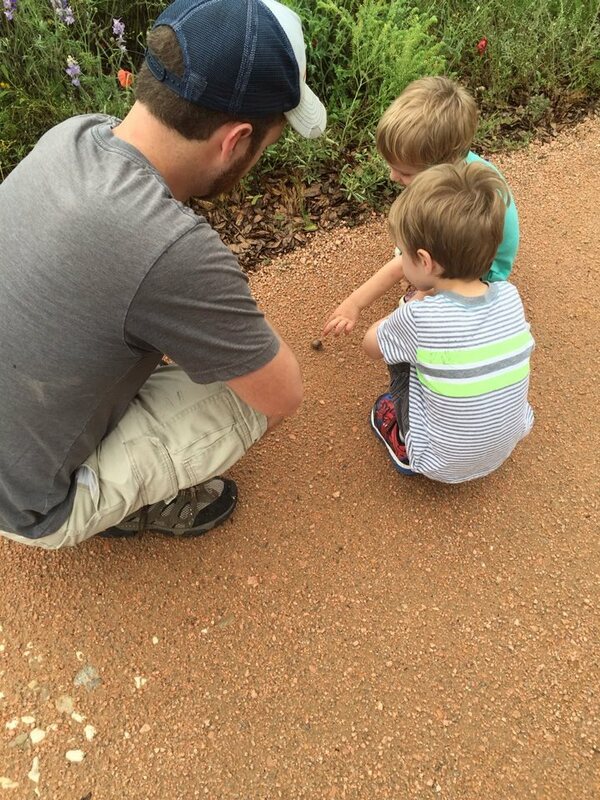 The boys loved the small wildlife they could interact with: snails, frogs, squirrels and hummingbirds. My dad and I went about half a mile down the road on Highway 290 to Bariloche Farm and got some peach cobbler with a side on homemade Mexican vanilla ice cream. The peach cobbler was good, but the vanilla ice cream was divine, y’all. It was so incredibly smooth with the flavor of real vanilla (none of that imitation stuff!) with a little bit of a warm spice. If you ever go to Fredericksburg and you’re a fan of ice cream, go here. I wish I could have tried other flavors. With blackberries and various peaches in season, they had those flavors too that use fresh picked fruit from their farm to make it. Is your mouth watering yet? Because it should be. Ok, I’m done with talking about the ice cream, but seriously, go there and get some. 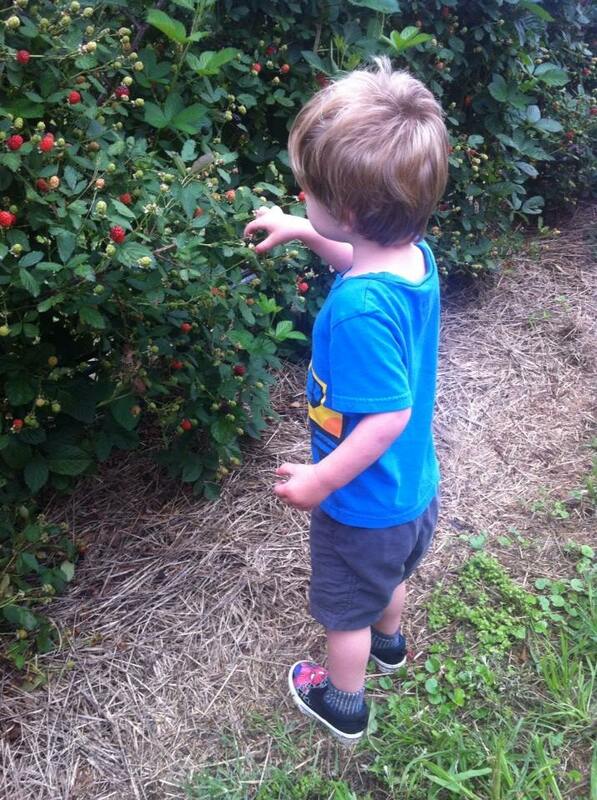 Saturday (which we decided would be our last day since this stomach bug was quickly invading ,every inch of the camper) we went blackberry picking at Marburger Orchard. This was by far, my favorite activity of the weekend. We arrived early and after a short introduction by Gary, we chose our row and started picking. Despite the thorns on the bushes, the boys dug right in. 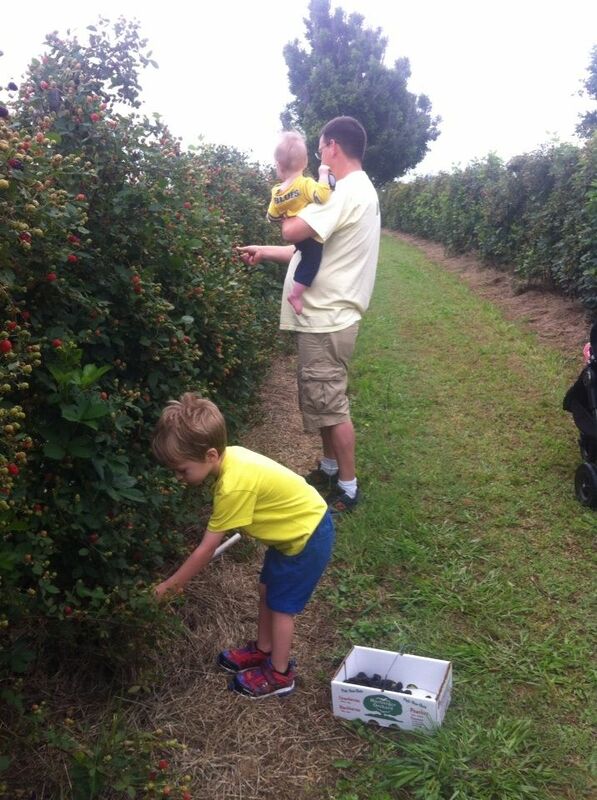 It was a great opportunity to teach the boys about fruit ripening, because you could see all stages of the berries. Honestly, we probably could have stayed longer, but we had already filled our box holding 6 pounds of blackberries. Despite the fact that almost everyone got sick, we had a blast last weekend. My heart beats a little faster in the country. The idea of having my own year round garden makes me smile. I love watching my boys get excited about God’s creation. It was such a sweet reminder to take things a little slower, linger outside a little longer, and appreciate nature’s playground. What’s your favorite thing about nature?